The drawer thing's because Hwyla was replaced with Waila. I noticed that in the .cfg's for mystical agriculture the maxy for ore spawning for prosperity in the overworld is set to something in the 60's. We're currently at Y=91. Could this have something to do with why we aren't seeing them spawn? I thought this might not be the case though because we are seeing diamond ore and other mods ore's spawn in as well. It looks like it's only mystical agriculture. I would like to say though. Really enjoying the modpack. It's such a refresher playing it and just not another generic skyblock which follows the same paths. I love having to dive and figure out how to automate things I've never really had to automate before (Shard/ingot production). Also the end portal spawning silverfish was a nice surprise! I'm glad there is a good level of difficulty here. Integrated dynamics/tunnels is a great mod I had never had the pleasure of working with before. I had gotten so reliant on using enderIO for conduits so it's nice to dive a little deeper into another mod pack for item/fluid/energy transportation. There is one small bug with integrated tunnels though where sometimes the tick rate/server lags (mostly during loading up the world) where it can break the import/export functionality. But simply breaking the cable and re-placing it seems to fix it. Also noticed that sometimes when the server lags every so often the lava tick is faster than water causing my automated botania ore farm to break. But that's more of a computer issue (even with 12 GB allocated it sometimes skips ticks). I am speechless right now. I mean, you just numbered everything the pack is in my mind. Oh, you were talking about the... is that wood? So I managed to get the Rock Crusher from Sky Resources to try to automate ingot collection, but I can't figure out how to get power into it for the life of me. I tried Tech Reborn copper cables but they don't connect- I tried putting a generator (from Tech Reborn) directly next to the rock crusher and get no power still. I might be missing something obvious, so that's why I'm asking for help here. Can anyone help? You can use the pipes from Fluxed Redstone (I think it was called) and integrated Tunnels. I really don't know if I should blame Storage Drawers, but I still will. Look up the Flux mod. You can type in: @Flux and it will show you a bunch of items. Generator should work though. I was using a generator until I upgraded to Gas turbines. It also has flux cables/pipes too which work. Ahhh, okay I see. Thank you. I meant cables, but I believe you understood. Hmm, I was messing around with these for a while, and I had some sort of issue where the power put into the rock crusher went rapidly into the negatives. Like... I have -1000000 FE kind of rapid. To reset it I only had to use a wrench, but when I broke the generator to see if I could fix this, my game crashed. I figured it was because I had millions of negative power and more being generated, but it doesn't actually seem to be. The problem got better when I tried using the gold fluxed wire, but I still managed to get millions of negative power after some time. So overall, either these fluxed wires don't work right, or I'm doing something wrong. I can send a video or some pictures if you want to help me troubleshoot, also. Anyways, so you guys know, this version won't have a server as a few things went wrong, but the next one, which will be released soon, as a fix update, will. hmm.. I don't see a way to get graphite. 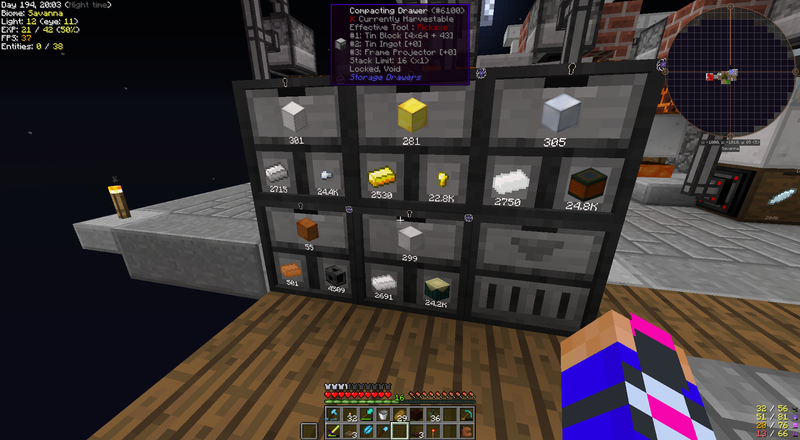 In other modpacks it's usually got by smelting coal/charcoal. The only recipes shown in NEI are by crushing down graphite ingots which can only be obtained through graphite dust. Am I missing something for this? Other than that, with the latest updates the items being deleted is fixed when filtering RS is fixed. Welcome! I'm trying to go through each mod (that I haven't already used before) and experiment with it. Loving the pack. EvilCraft is fun :) I'll report any more bugs I find as well. It's nice that after a long time, the pack's finally back to having less than 5 issues. It's great as I don't have to worry too much about them and huge packs usually have a ton of issues.